Well, what an amazing way to finish the course! I don’t think anyone has ever seen such an exotic and rich display of world food. To celebrate the end of the Just Bread course, we arranged for all the ladies to bring in a dish from their native countries. 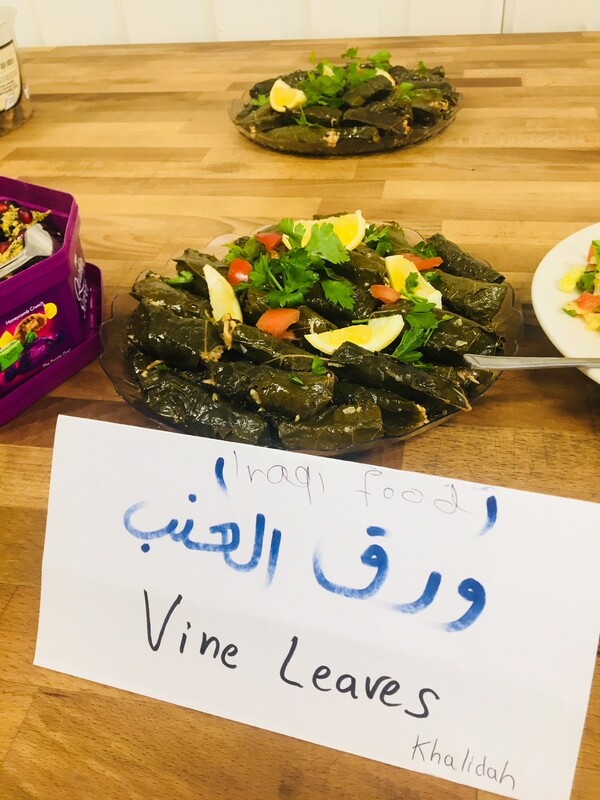 Everyone brought in something absolutely delicious and some even seriously went to town and brought in four or five absolutely stunning dishes! Everyone at the bakehouse was spoiled for choice. The purpose of the celebration was of course to celebrate the ladies’ graduation from the course, which they all completed with flying colours; not only did they learn a lot but we also learned so much from them. They were all so proud to receive their certificates and present (a bag full of baking goodies!) and it was a really touching moment to share with them all. We wanted to take this celebration of the course a step further and to turn it into a celebration of them and of their inspirational lives. 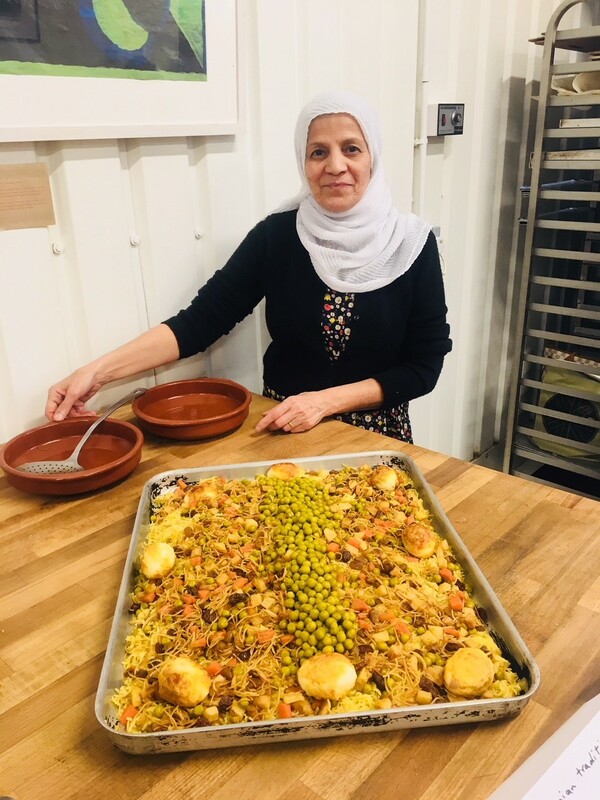 Considering how much they all love cooking, which has been profoundly demonstrated throughout the course, we invited them to prepare a dish each and to share with us the name of the dish in their mother tongue and in English. We were lucky in that the photographer, Abdul, who has been present throughout the course, was also there today to share in the festivities and also to take beautiful portraits of the ladies and their food. It was a wonderful moment of sharing and integrating and being bonded with one another around a table which was an exemplary example of true integration and appreciation of people from all round the world. The food itself seemed to echo the rich and joyful personalities of all the ladies. 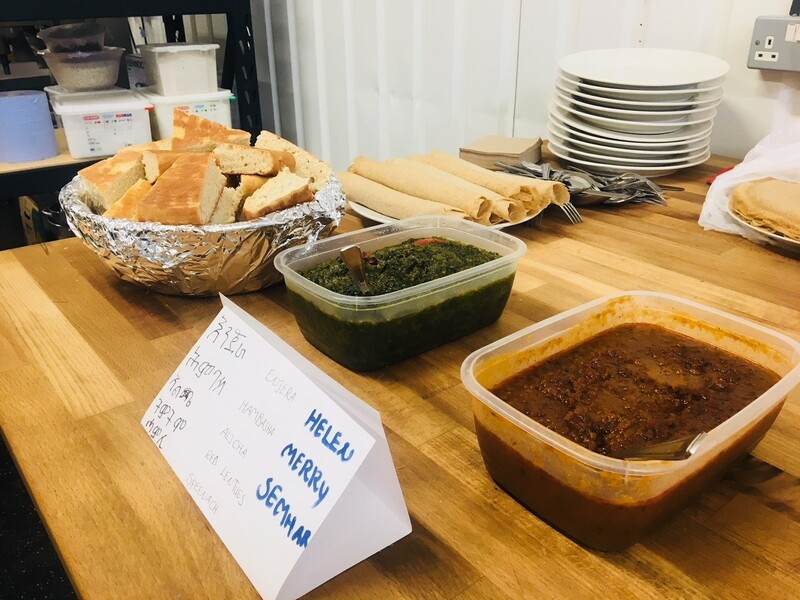 The table was a colourful array of beautiful Eritrean breads, yellow saffron Iraqi rice and glistening stuffed vine leaves, aubergines sprinkled with pomegranate seeds, bright red and green lentils, a steaming Iranian soup, and gorgeous golden Georgian honey cakes. Spread on a huge butchers block in the garden like a medieval banquet the table became a melting point of appreciative chatter and bonding friendships. 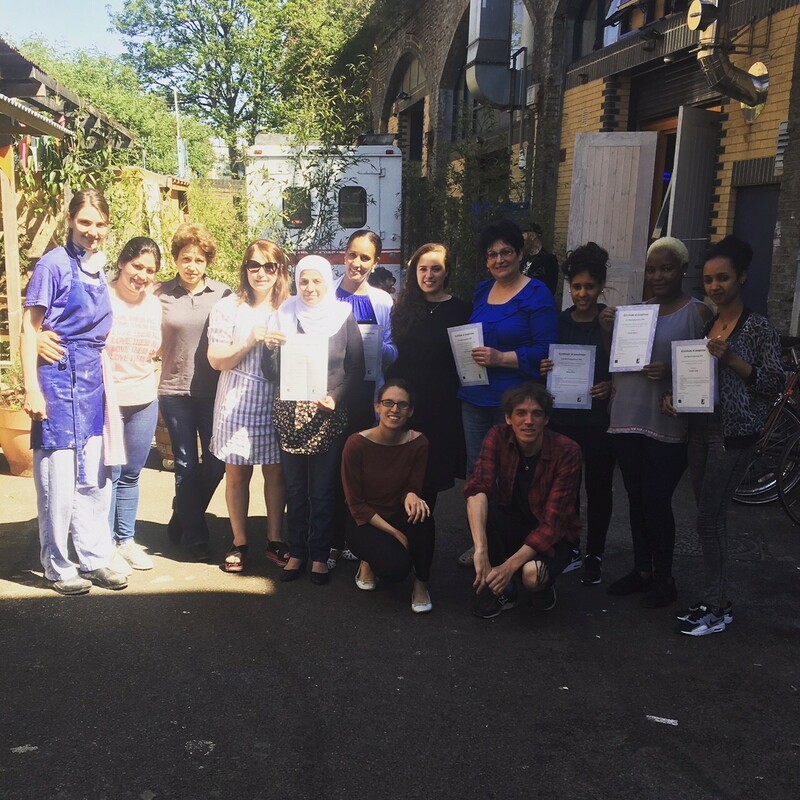 A comment from one of the ladies to another was, ‘I can feel so much love in your food’ – this phrase is what really sums up and defines the Just Bread course and the friendships formed. 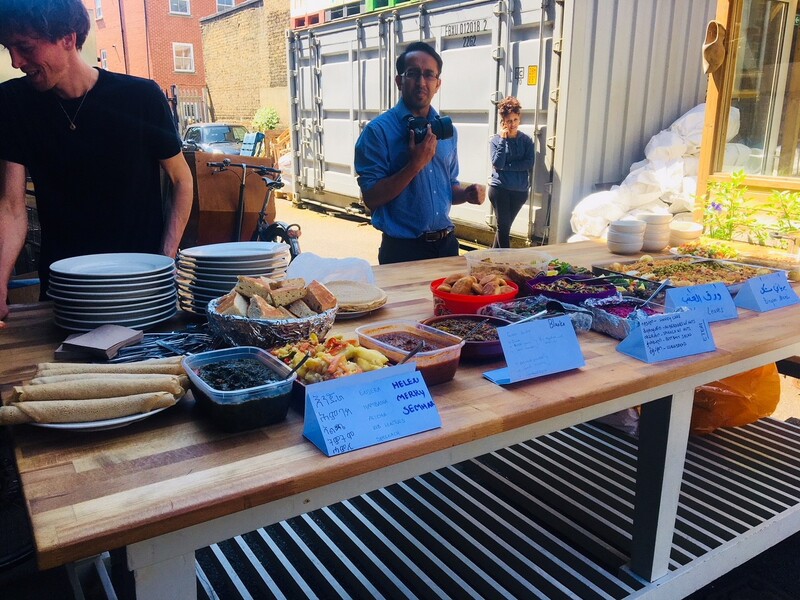 Thank you to the British Refugee Council and the e5bakehouse for providing the foundations for this love through food to be found, forged and fulfilled.